Comic Robert Klein makes his living by being funny. 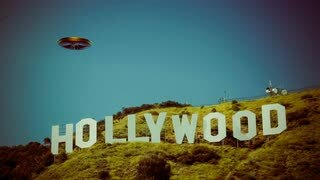 Yet he revealed during the course of an interview that he is extremely serious when it comes to at least one topic – UFOs. Currently co-starring with Burt Reynolds in the movie, Hooper, Klein says he finds the concept of interplanetary visitors an engrossing subject. It is a controversial area that has fascinated him for more than 17 years – going back to when he had a UFO sighting of his own. began reminiscing about his experience: “My parents had sent me to a camp in Kent, Conn., for the summer. On this particular occasion, there were about 25 of us guys killing time just fooling around – playing baseball or something. Before I knew what was happening, a group of my buddies were looking skyward and pointing excitedly at something. I immediately saw what had captured their attention. There, in plain view, were these six cigar-shaped objects moving by at an extremely high altitude. Klein makes it quite clear that he is not an expert on the subject of UFOs. 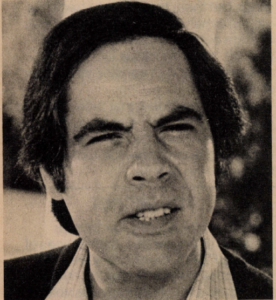 “I don’t want people to get the wrong impression and to think that Robert Klein goes around seeing flying saucers all the time,” he declared. “That happened quite a few years ago and I’ve never seen anything like them before or since. In fact, I couldn’t swear that what we observed was an armada of interstellar spaceships. That’s only speculation. But at the same time, we were so startled about what was happening that we moved quickly to call the nearest military installation, a Naval base, to report what we had seen. A representative of our group, the only one present who wasn’t speechless or tongue-tied, spoke for several minutes to a high official at the base. Apparently, he took us very seriously and even admitted that other reports had been received at about the same time. Despite obvious concern on their part, they never called back to explain what it was we had seen. But I’m told it’s par for the course, as I understand the government has a tight-lipped policy about such things as flying saucers.” When asked to speculate on what they might have been, Klein says if they weren’t from outer space, then perhaps they were top-secret military aircraft.